An algorithm is a process or a set of rules to follow. We think of algorithm = computer, but it can apply to very human endeavors as well. Like hiring. The reason a repeatable hiring process, with the exact same set of questions for each candidate, works well, is that humans are excellent at picking out patterns. However, we struggle with repetition. The algorithm gives us repetition. Hiring algorithms work best when the team is looking for traits that the position needs for success. Like “persistence despite setbacks” in sales or “accuracy under pressure” in accounting. A process helps reveal insights. It’s been four months since we installed an algorithm for a client. While the positive results are anecdotal, the management team tells me they “dodged a bullet” with candidate A and “uncovered a gem” with candidate B thanks to their algorithm. It’s a pattern I see time and time again. 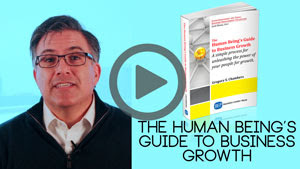 I made a promotion video for my book, “The Human Being’s Guide to Business Growth.” Take a peek. I am putting the final touches on a compact yet powerful online seminar that uses parts of the book to help everyone in your organization close business faster. Without being pushy jerks. Look for a special announcement in the middle of next week. My bride took me to a cooking demonstration last week. 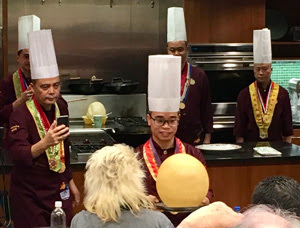 Two hours with Chinese Master Chefs specializing in Catonese cuisine. It was excellent. Incredibly entertaining. Sitting next to us were two pleasant, young Chinese women. My first thought, Do they speak Chinese? My scond thought, What’s their favorite Chinese restaurant in Omaha? I learned a lesson in my twenties that I hold back in asking certain questions. At a friend’s wedding, I bellied up to the bar next to a classmate I hadn’t seen in years. She was wearing a big flowing dress and looked heavier than I remembered, so I thought, pregnant! and said, “Hey! When is your baby due?” As soon as I asked I knew she was, um, not pregnant. She wrinkled up her face, stared at me, then said, “Did Joe’s Uncle put you up to this?” I was frozen. Solid. Couldn’t utter a word. “Did he?” she persisted. Since then, I try to gather more information before asking questions. In this case, one of the women asked the chef a question in Cantonese. Bingo! They speak Chinese. Turns out they are both from Hong Kong, one a professor, the other married to a professor. One of them is expecting her first child in June. And their favorite Chinese restaurant in Omaha is Gold Mountain.